There’s no question about the fact that having a big load of student loan debt can impact your entire life. We read recently that the average college graduate leaves school owing around $26,000 in student loan debts. If that’s not bad enough, there’s really no way to get rid of them. You could even file for Chapter 7 bankruptcy and it wouldn’t make any difference. You would still have those debts. However, there are ways to at least get them reduced and here are nine. If you’re a government worker or the employee of a nonprofit organization, have been in your job for 10 years or more, and made 10 years of your monthly payments, the remaining balances on your Federal Direct loans would be forgiven. You are required to work at least 30 hours per week or whatever your employer defines as full-time work to be eligible.. The employers you could work for that would be eligible include federal, state and local governments, nonprofit organizations, AmeriCorps and the Peace Corps. There are actually three categories of AmeriCorps – AmeriCorps Vista, AmeriCorps State and National and AmeriCorps NCCC. If you work for one of these organizations, you would get a small living allowance of about $24,200 a year. While you’re serving, the payments on your federal loan would be deferred. Then after a year, you would get a financial award that would be equal to the largest Pell Grant available that year. Your term of service would be 10 months but you could remain a volunteer for two financial years. The following video explains more about National Service through AmeriCorps and the various jobs you might have if you were to sign up. Service in the Peace Corps requires a 27-month commitment, though you can work longer if you choose. Once you serve for two years, you will get a payoff of 30% of the original amount of your Perkins loan. You can also defer payments on all of your federal student loans while you’re serving. However, the program’s pay off after you complete your term of service can apply only to Perkins loans and is 15% of your initial loan amount for every year you are in the service for the initial two years and then 20% more each year if you stay an optional third and fourth year in the service. This all-teacher version of AmeriCorps offers a salary of $25,500-$51,000 a year. If you serve in Teach for America, you would have your loans deferred during the time you serve just as with other AmeriCorps programs. You would earn an annual financial award the equivalent of the biggest Pell Grant then available. The government also offers grants called Teach grants for as much as $4000 for people who will teach for at least four years in a in a high-need field. This service requires a two-year commitment and is open to any licensed health care provider in various fields. The National Health Service Corps will pay off up to $60,000 of your loans after you have served for two years if you work in a facility that qualified and has a worker shortage If you don’t qualify at that level, you could get paid off at least $40,000 worth of loan payments over two years. There are a number of loan forgiveness options available through the US military. 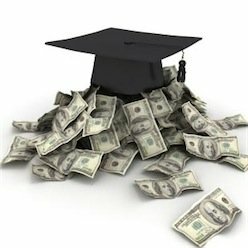 Both the Navy and the Army will forgive up to $65,000 of student loan debts though the Air Force’s College Loan Repayment Program offers only $10,000 per person. You should also be able to defer your student loan payments while you’re in the military and have your interest reduced to 6% on all loans. If you have a doctorate degree in a health field and are engaged in research for the government or a nonprofit organization, you may be able to get loan payback of up to $70,000. This requires a two-year commitment and is run by the National Institutes of Health. If your debt is above 20% of your yearly salary from the sponsoring institution, you could earn up to $35,000 in loan reduction each year for two years. However, you will have to spend at least 20 hours a week researching. Anyone who is a college graduate and a US citizen would be eligible for this GoCorps program assuming that you are between the age of 20 and 30. There is no salary. Your loan payback could be $5000 but this would include the $2500 you would be required to raise yourself. The loan forgiveness part works like a matching gift. If you raise $2500 by yourself by the end of two years, GoCore will match the moneyso you would have $5000 specifically for student loan payments. Counties and cities across the United States are offering repayments of student loans if you simply move there. It’s really that simple. For example, Niagara Falls is now providing nearly $7000 to recent graduates who will live in selected neighborhoods within the city for two years. Also, in Kansas there are 50 counties that have been named “Rural Opportunity Zones.” They will hand out a maximum of $15,000 in student loan payments spread over five years to those who enroll in its relocation program. There have been 886 applications for the program since it began in 2012 with 509 already approved this year.